Helping more than 1,000 universities across the globe integrate their research administration processes online. Spend less time managing paper, and more time doing research with subject pool software. Sona Systems® software eliminates the need for paper-based methods by integrating every function of the research administration process online. Our software provides a seamless user-experience, allowing researchers to schedule studies and begin recruiting participants quickly and effectively. Our prescreen function gives administrators the capability of setting up questionnaires to ensure only qualified participants can view and sign up for studies. Sona Systems generates an array of reports, which allow administrators to track credits earned by participants and monitor overall system usage. The platform enables researchers to view who has signed up for their study and grant credit or track a participant's activity. Sona Systems' built-in online survey function allows researchers to set up studies and collect data from participants anytime, anywhere. We make it easy for researchers to integrate their studies with popular survey tools, while tracking participation and managing eligibility. Trusted by top universities around the world for more than a decade. 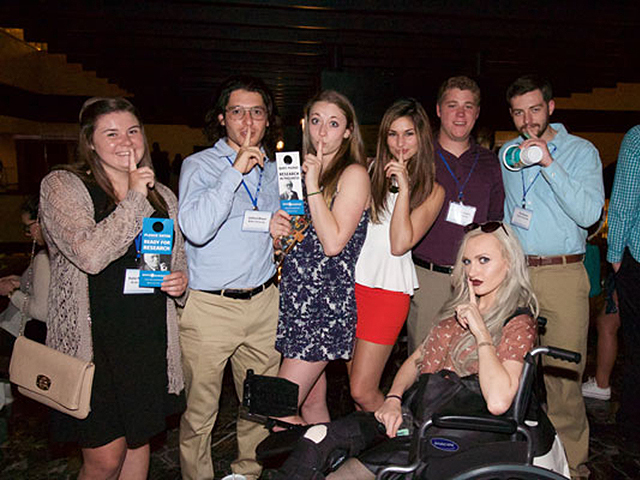 Students renew their energy and excitement for science, learn about the latest scientific discoveries, and gather to watch schools of fish circle our diver at the SPSP 2018 student social. A researcher presents her research which used Sona Systems to recruit and manage participants. Students, researchers, and Sona Systems descended on Granada July 8, to attend lectures, participate in presentations, converse at round-table discussions and observe posters alongside some of the world's most renowned and influential people in the global scientific community. 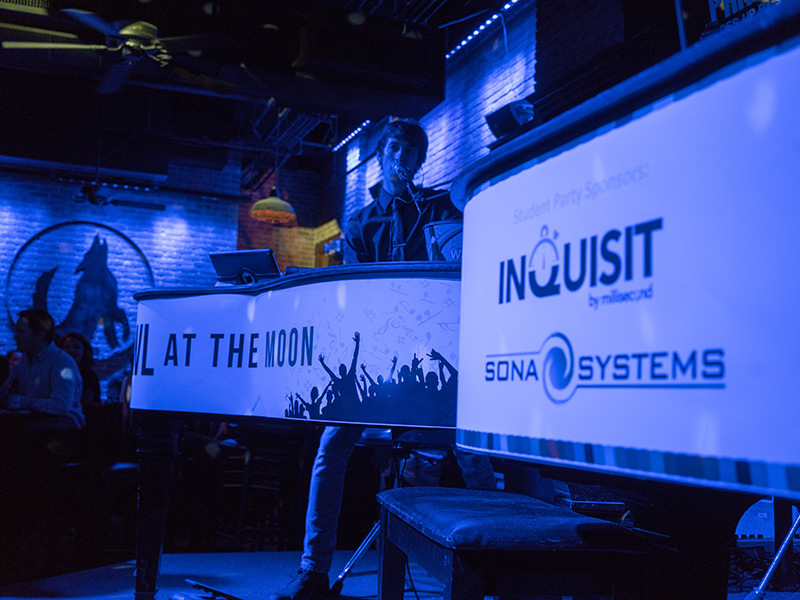 The first 500 attendees enjoyed free drinks, dueling pianos, and networking at the 2017 SPSP Student Social â€” compliments of Sona Systems. Thanks to all the students who came out! 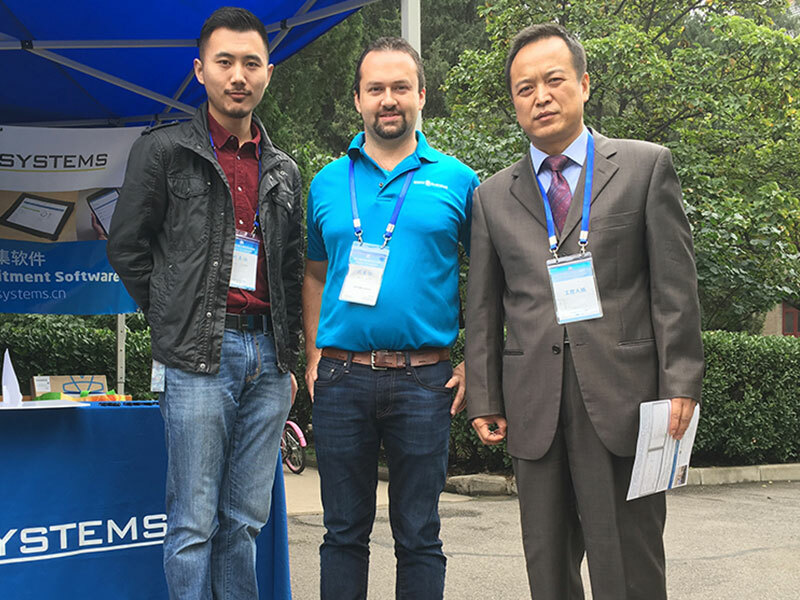 Pictured here is Sona Systems President Justin Fidler (center) with Dong Zengyun (right), vice dean of School of Psychology at Shaanxi Normal University, at the 2016 CPS Annual Meeting in Xi'an, China. Sona Systems software is used by top universities in China as part of their world-class research programs. Research administrators and researchers with a focus primarily in the field of psychology were excited to see our brand advocates at the conference and learn about our continued growth in Japan and other Asian countries. 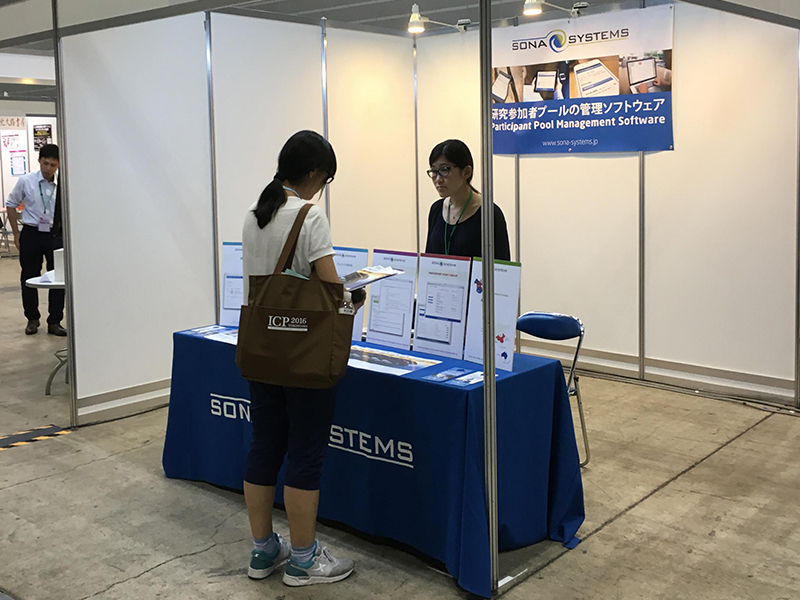 The best universities in the world are using Sona Systems participant management software, and we were very happy to be invited to spread the word -- thanks to everyone who stopped by our booth! 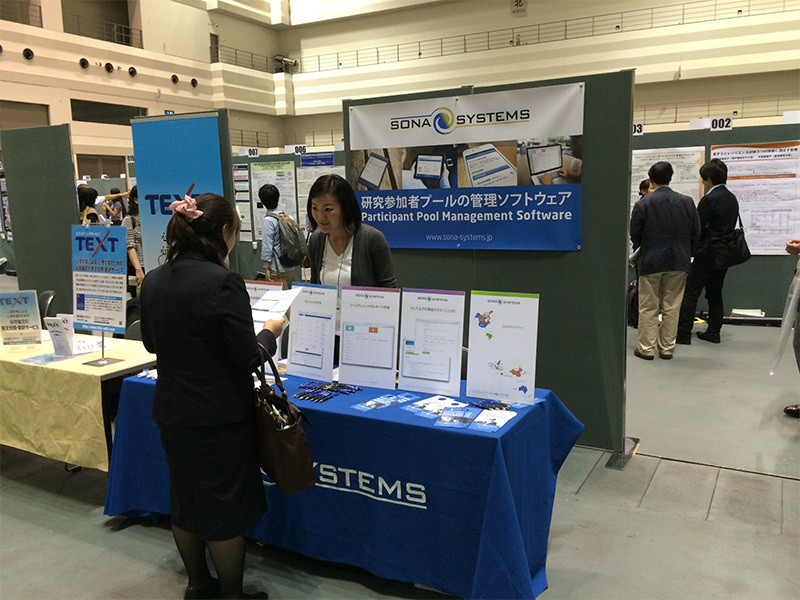 Thanks to a Japanese language interface for participants, Sona Systems has been influential in changing the way Japanese universities and researchers conduct studies. Here, one of our representatives speaks with a potential customer, shedding light on how her department can save countless hours with Sona Systems' leading-edge software. 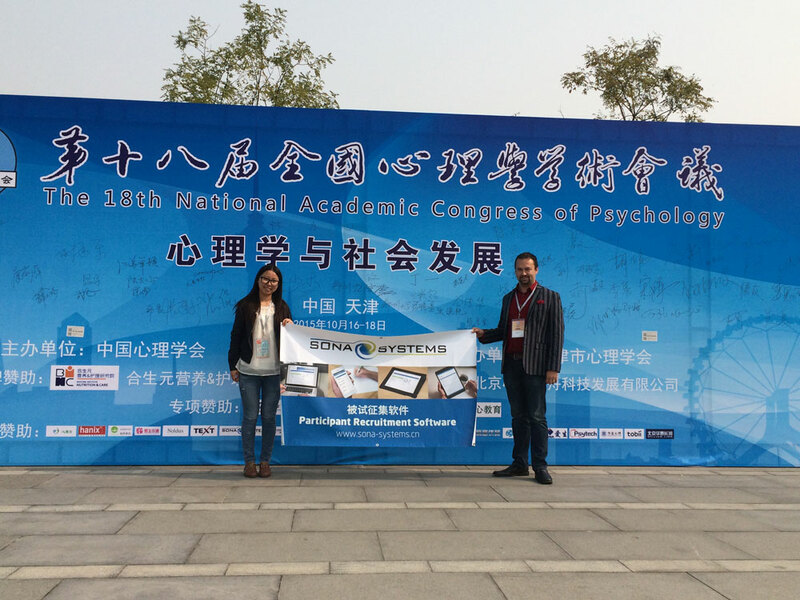 Representatives of Sona Systems spent ample time promoting our industry-leading capabilities at the 18th National Academic Congress of Psychology in Tianjin, China. Universities all over the world are harnessing the power of the system to improve their research recruitment and participation. 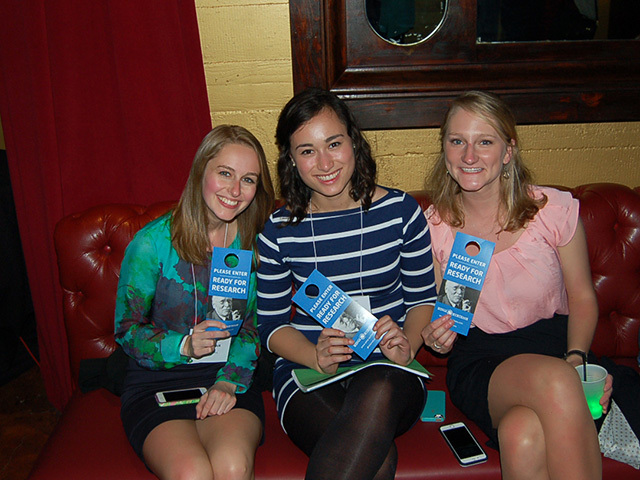 Sona Systems sponsored the APSSC Student Social, which invited student researchers to come together for networking and refreshments. 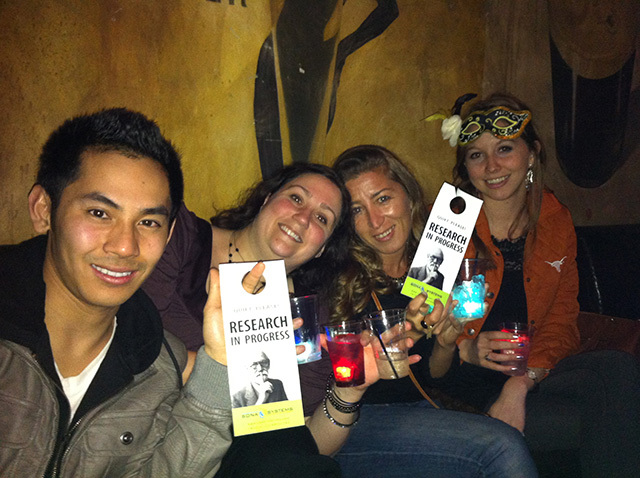 Above, conference attendees hold up door hangers, and remind everyone to keep it down as research is being conducted (as displayed on the door hanger). Researchers from the SPSP conference meeting at Federal Bar in Long Beach, CA for the GSC Student Social, which was sponsored by Sona Systems. 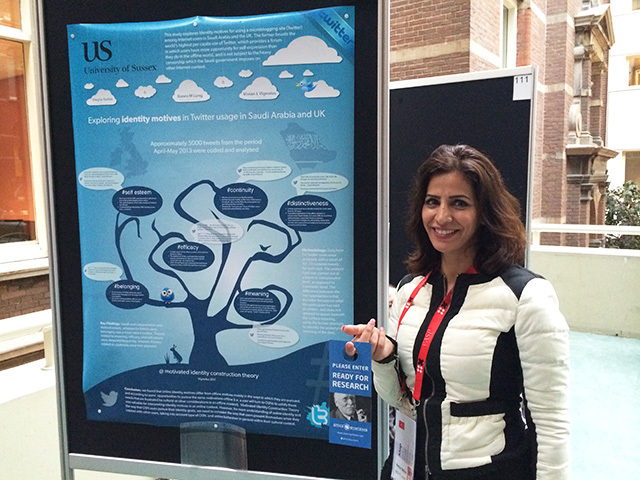 Researcher Heyla Selim of University of Sussex at the EASP2014 conference in Amsterdam presenting her project about identity motives in Twitter usage in Saudi Arabia and UK. 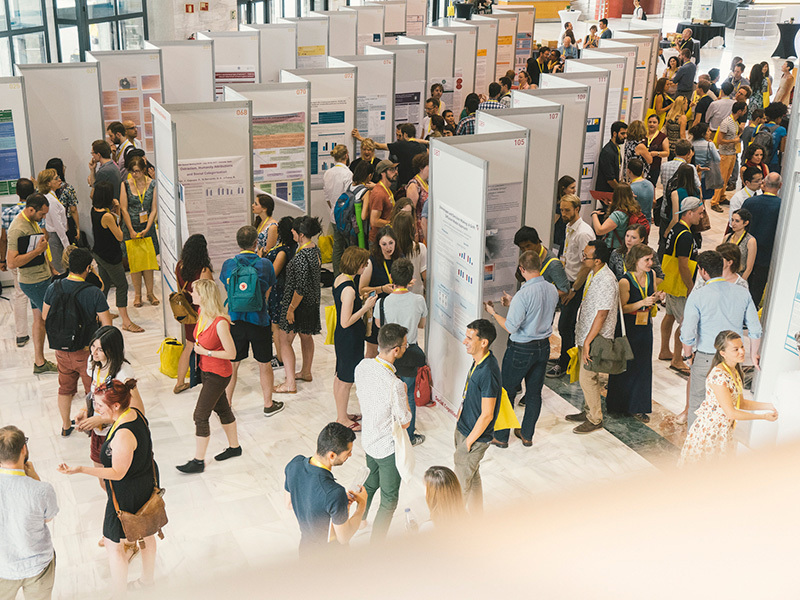 Participants were recruited using Sona Systems software, and presented in the Atrium at The University of Amsterdam along with 700 other researchers and their posters. 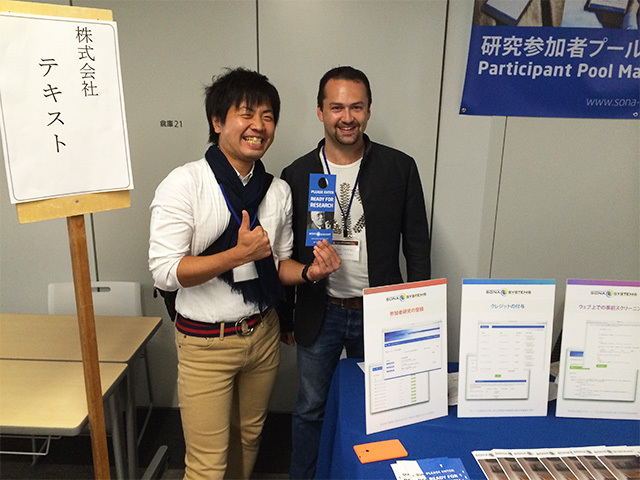 Happy customer Kido Moritoshi of Kobe Gakuin University and Justin Fidler from Sona Systems at the 78th Annual Convention of the Japanese Psychological Association, which was held at Doshisha University in Kyoto. This conference attracts psychology researchers from all over Japan. 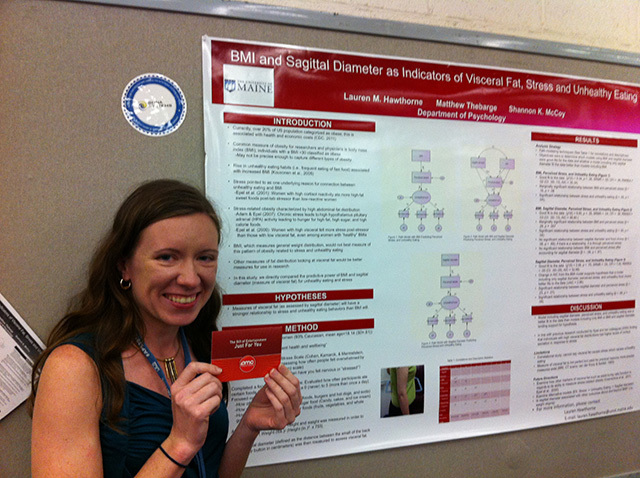 Sona Systems gave out prizes at the Association for Psychological Science 2013 Annual Convention to those who conducted and displayed compelling research using our software. Above is one of the winners of the contest, a researcher from University of Maine, who received a gift card to the local movie theater. 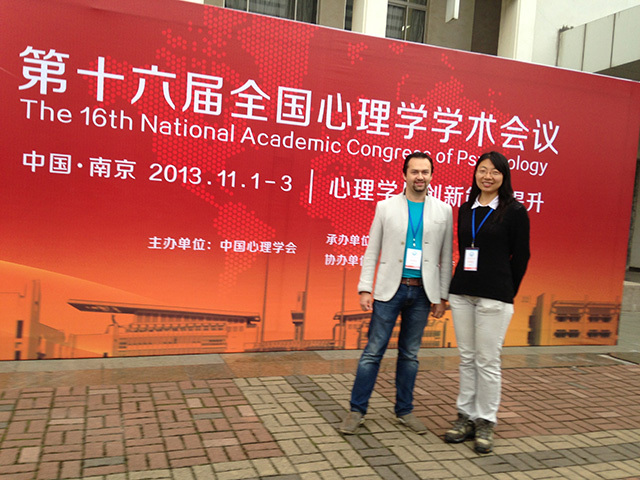 Our software is gaining popularity in China, and to show our commitment to the global research community and benefits of cloud-based research, we attended the Chinese Psychological Society Annual Meeting in Nanjing. Above is Justin Fidler, President of Sona Systems, and translator Cong Wu. During the Annual Meeting of the Society of Personality and Social Psychology (SPSP), researchers and customers (above) took time to join us for drinks and music at the GSC social event sponsored by Sona Systems. "Imagine nearly 8000 student sessions, hundreds of experiments, dozens of researchers, and you sitting in the middle of a sea of paper, complaints, missed sessions, confused students, frustrated experimenters and educators, and many millions of dollars in research grants on the line for a department with a #1 nationally ranked program. Now imagine, in the span of 1 quarter, removing almost all paper and providing 24/7 access, increasing participation, greatly reducing staff time and errors, providing realtime feed-back and reporting to all concerned parties, and sailing through Human Subject approval with a turn-key system. 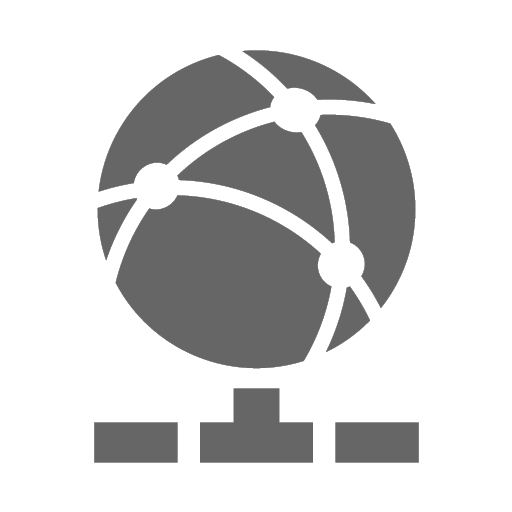 Furthermore, imagine no server management costs, and no technical staff time needed beyond walking staff through initial setup, and you have our experience with Sona-Systems." "As a new lab manager, using Sona Systems has been vital in the success of my lab. I have been able to increase my subject pool by 150% recently and have more efficient studies overall." "The Sona scheduling software has revolutionized the Research Participant Group operated by my lab. Its ease of access has increased usability for both participants and researchers, and most importantly, has improved signups and the level of support we can offer. Using this software, my lab has grown a flourishing group of participants who are active and engaged. This software platform has allowed us to easily recruit large volumes of participants on short timelines. I can't recommend this software highly enough." 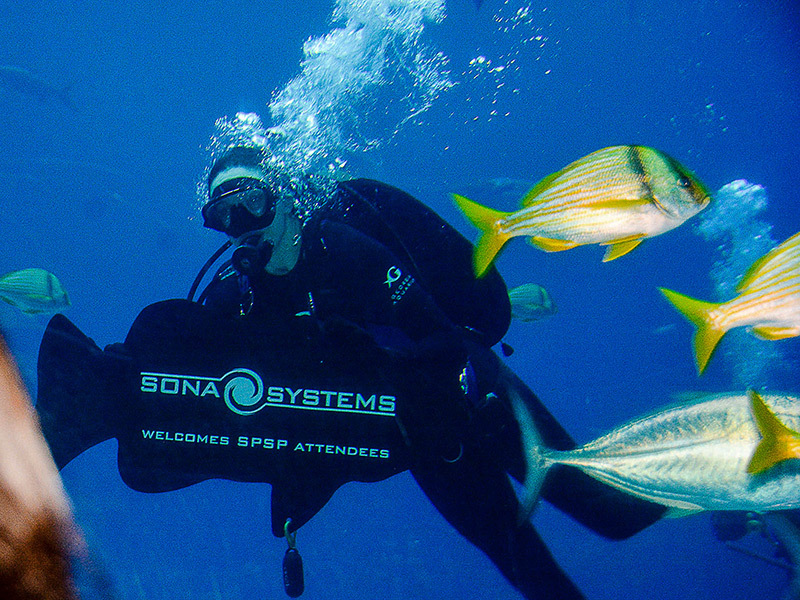 "I am so delighted that we chose to team with Sona Systems to help manage our research study. The system is elegantly designed and very intuitive to use, allowing our research staff to easily recruit, screen, and track our participants from start to finish. I cannot say enough about the customer support offered-- they are just amazing human beings who have provided me with countless solutions to any question I had about how to best use their system for the study's needs. I am very impressed with the entire Sona experience and recommend it highly." "I feel privileged to write this testimonial because I am highly impressed with the Sona system and the amazing support that is offered. I was introduced to the Sona system as a user primarily and simply loved its various features which helped me in managing my research. Now, as the administrator of the Sona system for JCU Singapore, I even adore it more because whenever I face challenges, the prompt technical support helps me to get the things done right on time and makes my life easier. I truly endorse the SONA system and would highly recommend it to other universities/institutions for efficient management of their research programs. It's a paperless online system which also helps in going green, reducing paper waste and saving our planet." "Our UNM faculty and students have found the system both easy to use and extremely convenient. It has replaced an antiquated paper-based signup system, eliminated "lost" paper-signups, improved student security, and has dramatically improved the speed for getting credit to students after their participation. 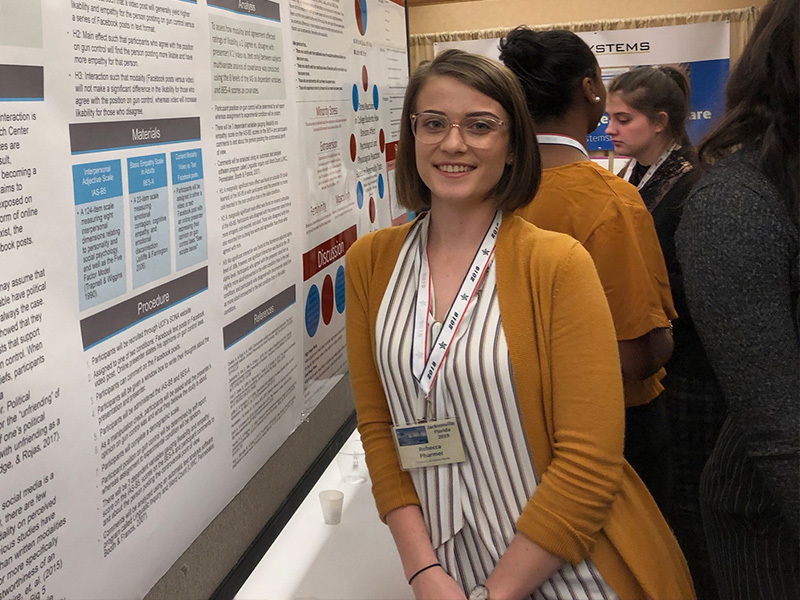 Our students are also more likely to participate in research studies than defer to alternatives (for example, writing reports on published research)." "We just wanted to thank you for all your help and support during our first year. The pool would have collapsed without your software, partly because it was our first attempt at running a pool but mainly because of our very large student numbers, which would have led to impossible administration problems. Your system works extremely efficiently and we would have no hesitation in recommending it to other Psychology departments." "After switching to the Experiment Management System from Sona we experienced the usual growing pains of switching to a new system. Most of the issues could be solved by referencing the excellently written documentation that is provided and for the occasional questions an email to the support team. Every email I have sent to the support team was answered incredibly quickly a with a smile. Sona Systems has by far the best support team I have ever seen. Keep up the amazing work, and excellent product." "The software has been a wonderful asset for the department! Not only has it made my job 2-3 times easier and more efficient, but it also makes the students' job the same, thereby increasing the number of them who finish their research requirements successfully." 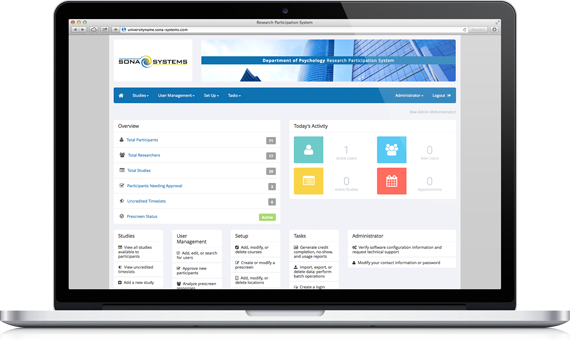 "Sona Systems provides an online experiment management system that is user-friendly and compliant with human subjects' regulations. What really sets Sona Systems apart from other companies, though, is their interest in constantly improving the system and incorporating customer feedback into upgrades." "Your system is awesome. I'm very impressed with your courtesy and customer service. Your prompt and professional replies to email is outstanding. Everyone in our department: instructors, students, experimenters, and me as subject pool coordinator LOVE the system. The frequent updates and flexibility make your system really stand out." "I'm impressed with your software. 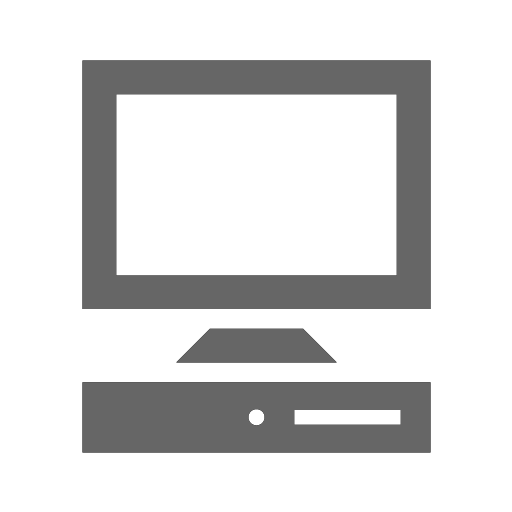 You've certainly covered a lot of bases (most of which I would never have anticipated) with the system preferences and features." Dr. Mark Vincent, Augustana College, Psychology Dept. "In all my 25 years of running studies, I have never had 100% of those who signed up for my study actually show up -- until we started using Sona Systems software." "Managing experiment sign ups for two to three thousand students a term is one of the easier parts of my daily grind thanks to the quality work you guys do." "My colleagues were very pleased with how the system operated in our first semester. It improved management of research enormously. It also allows us to collect data systematically on how much research we are doing for the first time. Thanks!" "The software has made the staff here very happy. Sona Systems software is some solid coding and their support is of a rare caliber." "Sona Systems software has been a tremendous asset to the department and is incredibly user friendly. Customer service is unsurpassed!" "The entire department is VERY pleased with the Sona Experiment Management System and how it makes our work so much more efficient." "The system seems to be working really well, and clearly improving the throughput of participants. Remarkably hassle-free, given the numbers involved." "We have found the Sona system to be extremely well designed and entirely suited to our needs. It has transformed the way in which we administer participation credit and has been of distinct benefit to staff and students alike. As many others have noted, the customer service is superb." "This system has been an exponential improvement over our old paper-based system and saved us countless hours of work." "I tell all my colleagues at other institutions not only about the software, but about the extraordinary customer support. How you all manage that level and speed of support is amazing!" "I've been continually impressed with your responsiveness to your customers combined with the elegance of your solutions." "SONA really is a 'golden' system. We use it to manage our participant pool and we can't imagine using anything else. It is easy to use, incredibly versatile, and affordable which is important in this sort of economy. We love the system." "Our experience with Sona has been very positive. The system is reliable and it allows us to manage an important business process with relative ease. The staff at SONA Systems communicate proactively when there are changes to the software and they respond to input from their customers." "This is an incredible system and the support is simply brilliant! The number of students failing to complete required hours is a mere fraction of what it used to be." "The software was has so many configurable features, it met our unique needs perfectly.Sona Systems staff is always extremely responsive and helpful whenever we have questions. Sona Systems is continually adding new features to improve the software, many based on our requests." 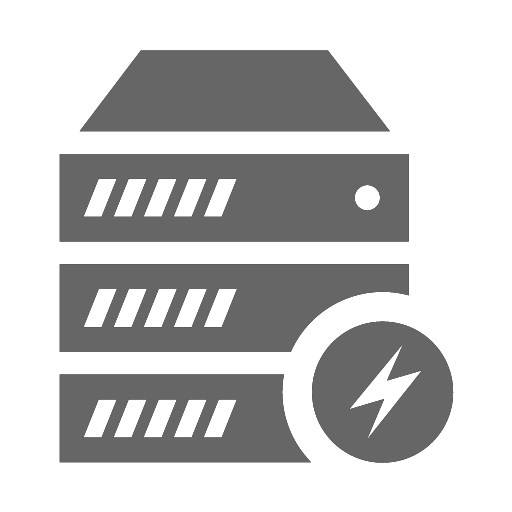 "Our site runs on Sona Systems servers, and it has always been fast and reliable. More importantly, we don't have to involve our own IT staff in the operations of the software, which is a big advantage for us." "One of the best things about the system is your staff - they are incredibly responsive and I never have to wait long for help. This is really essential - usually when I send queries to you, it's because I have received a query myself from a confused participant or researcher. I can always rely on your staff to respond to my questions within hours, so it's really very helpful to be able to get back to people so quickly." "Overall, the system is fantastic. In fact, the system is so well received that I received an accolade for "Graduate Student Teaching", as I facilitated a smooth transition between systems and subsequently "educated the department"-- no doubt I have the Sona support team to thank for making the transition so fluid." There is no obligation to buy and you can cancel at any time during your demo period.